Opponents of basing the Air Force's next-generation fighter jet in Burlington have a new trick up their sleeves: They want the state to compensate homeowners whose property could be devalued if the F-35 comes to town. "I mean, you can't have it both ways," Rep. George Cross (D-Winooski) said at a Statehouse press conference Thursday morning, arguing that the plane's proponents should be ready to dish out the cash to anyone harmed by the basing. "The point is if you are a legislator — if you are a Vermonter who supports the F-35 — then you must also support the notion that if you're wrong and, in fact, it is harmful and it has grave adverse impacts on people who live in the impacted zone, then in fact they deserve to be compensated in some fashion," Cross (pictured above) said. In a bill he plans to introduce in the House next week, Cross proposes to create an "F-35 Adverse Impacts Compensation Board" that would be charged with "awarding compensation to property owners, landowners and other persons harmed or damaged by the noise and other adverse impacts" of the planes. The board would be comprised of representatives from five cities neighboring the Vermont Air Guard base, along with an appointee each from the Burlington International Airport Commission, the state health commissioner and the state auditor. So who'd pay for such compensation, which could, of course, add up to quite a pretty penny? Cross says he's open to other ideas, but his bill suggests taking 20 percent of the state's annual appropriation to the Vermont Guard, in addition to charging a $20 landing fee at Burlington International Airport. "What we've done in here is not gonna work," he concedes about his proposed funding source. But clearly he's trying to make a point. 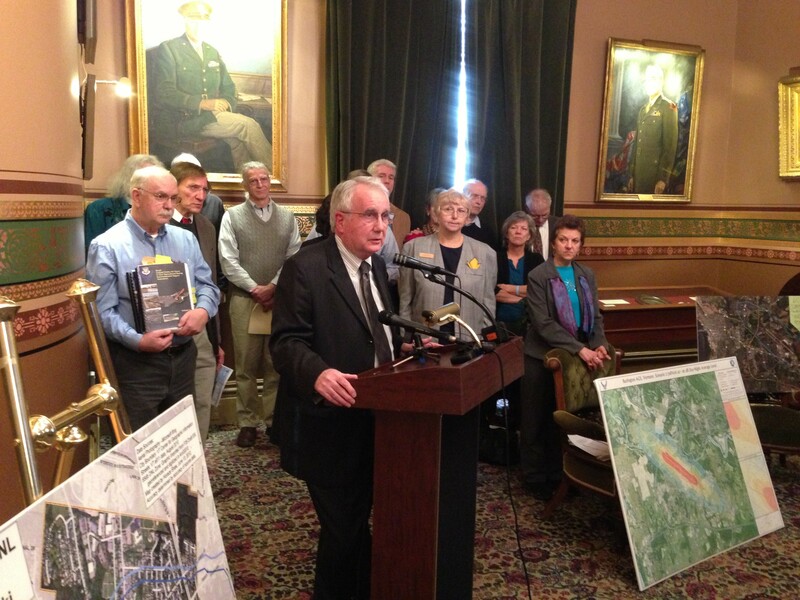 Cross unveiled the bill at a press conference called mainly to advocate for a separate resolution he and five other legislators are introducing this week calling on the Air Force to count Burlington out in its initial F-35 basing decisions. As we reported in this week's Fair Game, the resolution was modeled on a recent letter signed by 16 Burlington-area clergy members calling for the same. One of the signatories, retired Rev. Sarah Flynn of the All Souls Old Catholic Ministry, spoke at the press conference about how the clergy members came to their position. "Some of us found ourselves opposed to the location of the planes here and others were still undecided," Flynn said. "As a result of our conversations on this issue and the concerns that the clergy were hearing from their own congregations, we decided on a middle way of wait and see. Let's find out more about this — get some answers to these questions before we rush into something that could have terrible consequences in the long term." Cross acknowledged at the press conference that even his resolution — not to mention his proposed compensation board — faces fierce resistance in the legislature. Just five House members have signed on to the resolution thus far. A version of it will also be introduced in the upper chamber by Sen. David Zuckerman (P/D Chittenden), the senator said at the press conference. "I think that it's a long haul," Cross said.